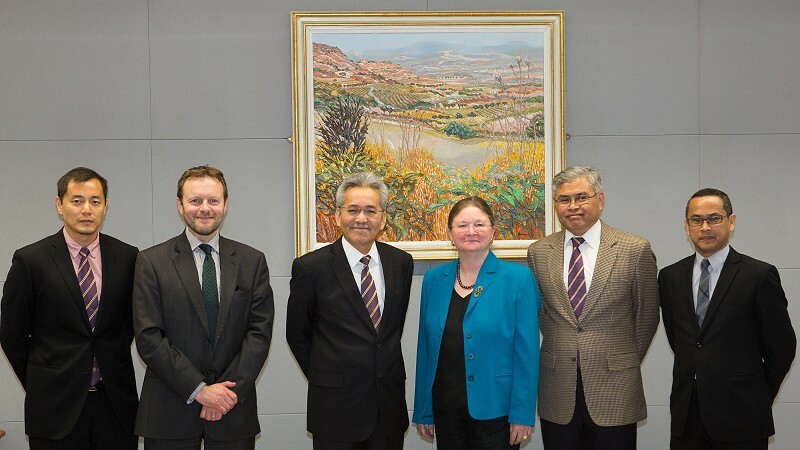 Pro-Vice-Chancellor (Internationalisation) hosts visit from Universiti Sains Malaysia to discuss collaboration in innovative doctoral programmes. Following the Pro-Vice-Chancellor (Internationalisation)’s visit to Universiti Sains Malaysia (USM) in February of this year, the Vice-Chancellor welcomed a senior delegation from USM on Tuesday 11 May. Led by Vice-Chancellor Professor Dato’ Dr Omar Osman and Deputy Vice-Chancellor Professor Dato’ Dr Muhammad Jantan, the delegation also comprised Professor Dr Lee Keat Teong from the university, and Associate Professor Dr Zainal Abidin Sanusi, the Director of Education Malaysia. Our visitors met with the Vice-Chancellor and Pro-Vice-Chancellor (Internationalisation) and explored partnership in innovative doctoral programmes in management and policy research. A round table included our leading specialists in higher education management (Professor Jürgen Enders), policy (IPR Director Professor Nick Pearce, Professor Hugh Lauder and Professional Doctorate in Policy Research and Practice Director Professor James Copestake) and education (Dr Mary Hayden and Professor Chris James). Professor Colin Grant said: "The University has a very important alumni community in Malaysia and I am delighted to have a Strategic Partnership with USM." Future actions to accelerate partnership activities were agreed and a further USM delegation will visit Bath next month.